This is a great post! Just doing something to be nice and help someone else is a great in so many ways. 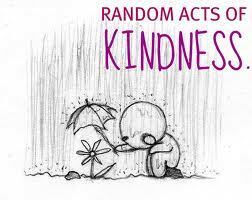 It helps people see the good that exists in the world, which can inspire them to do a random act of kindness. And let's face it, it scores us some pretty nice points with the universe, who pays in mysterious ways. If you ever get a chance to do something nice for someone else, do not waste the opportunity. You never know what you will gain from it. Most importantly it makes us feel good inside that we made a difference!